Abbington Green Bed & Breakfast Inn, Asheville NC: Abbington Green Bed & Breakfast Inn, Asheville, NC: Christmas is Coming! Abbington Green Bed & Breakfast Inn, Asheville, NC: Christmas is Coming! 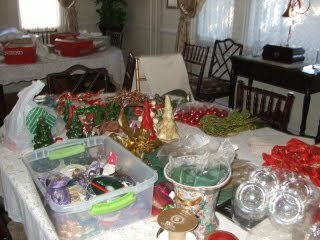 We all know the expression, "The calm before the storm"...But Christmas decorating at Abbington Green is just the reverse: It's the "Storm before the calm"!! I love the Christmas holiday season. For me this is Christmas number 18 here in Asheville, North Carolina. 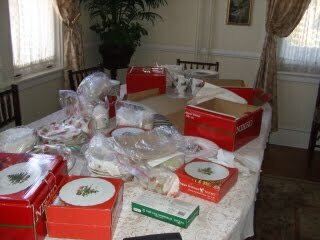 How quickly the time seems to have passed!Each year I can't wait to get out the decorations, and the Christmas china. Nearly 100 boxes come out of their storage places...not by magic, but with all the help I can get...up and down 3 flights of stairs, again and again and again. 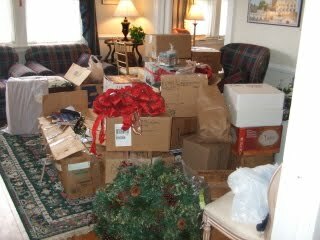 Next, the boxes are all put in the Parlor. 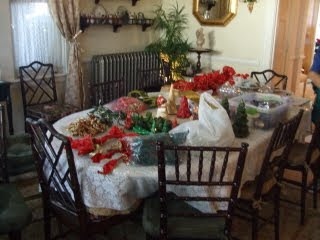 Next they are divided into groups organized by which room or outdoor area they will be placed. Boxes everywhere! 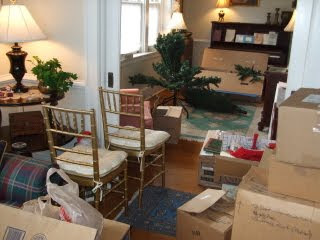 Trees being assembled. Garland and lights on the outdoor banisters.It takes more than 5 days to decorate the Main House first floor and the outdoor porches and decks. 8 full-size trees are outdoors, 2 of those are 9 feet tall. Indoors are 2 more full-size trees: one of those is 9 feet tall. And one of the suites in the Carriage House has a full-size tree in its living room, too. So here is what some of this process looks like! Coming soon: the 'Calm after this storm'!